↑ "Street Vendors: Tabled in Parliament’s last session, this Bill could bring security to our urban poor". Mint, Lounge. Nov 2, 2012. http://www.livemint.com/Leisure/NN6NKSWlU0wsojynMwFBBJ/Street-Vendors--The-god-of-small-sellers.html. ↑ "Reclaiming the city for street vendors". The Hindu. 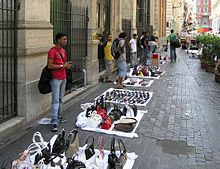 نومبر 3, 2012. http://www.thehindu.com/opinion/columns/Harsh_Mander/reclaiming-the-city-for-street-vendors/article4058121.ece. ↑ "Bill in Lok Sabha to protect rights of street vendors". The Economic Times. Sep 6, 2012. http://articles.economictimes.indiatimes.com/2012-09-06/news/33649866_1_street-vendors-livelihood-rights-coal-block-allocation. ↑ "Govt introduces street vending bill in Lok Sabha". The Times of India. 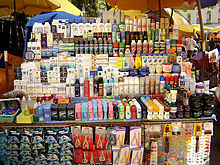 Sep 7, 2012. http://articles.timesofindia.indiatimes.com/2012-09-07/india/33676083_1_livelihood-and-regulation-street-vendors-lok-sabha. ↑ "Street Vendors Bill passed in Rajya Sabha". The Hindu. 19 فروری 2014. http://www.thehindu.com/news/national/street-vendors-bill-passed-in-rajya-sabha/article5706501.ece. Retrieved on 20 فروری 2014. ↑ "Parliament nod to bill to protect rights of urban street vendors". Economic Times. 20 فروری 2014. http://economictimes.indiatimes.com/news/politics-and-nation/parliament-nod-to-bill-to-protect-rights-of-urban-street-vendors/articleshow/30725912.cms. Retrieved on 20 فروری 2014. ↑ "Street Vendors (Protection of Livelihood and Regulation of Street Vending) Bill, 2012 passed by Lok Sabha". Press Information Bureau. 6 ستمبر 2013. http://pib.gov.in/newsite/erelease.aspx?relid=99161. Retrieved on 20 فروری 2014. ↑ "Gazette Notification". Gazette of India. http://egazette.nic.in/WriteReadData/2014/158427.pdf. Retrieved on 7 مارچ 2014. ↑ Chesney, Kellow 1970. The Victorian Underworld۔ Penguin p43–56; 97–98. ↑ Mayhew, Henry 1851–1861. London Labour and the London Poor۔ Researched and written, variously, with J. Binny, B. Hemyng and A. Halliday. ↑ "Manteros, mafias y delitos" (in Spanish). La Nación. فروری 3, 2014. http://www.lanacion.com.ar/1660748-manteros-mafias-y-delitos. Retrieved on فروری 12, 2014. ↑ Giro, Radamés 2007. Diccionario enciclopédico de la música en Cuba۔ La Habana. vol 3, p262. ↑ "Nine Famous Baseball Stadium Vendors". Mentalfloss.com. 2009-05-06. http://www.mentalfloss.com/blogs/archives/25302. Retrieved on 2013-08-18.